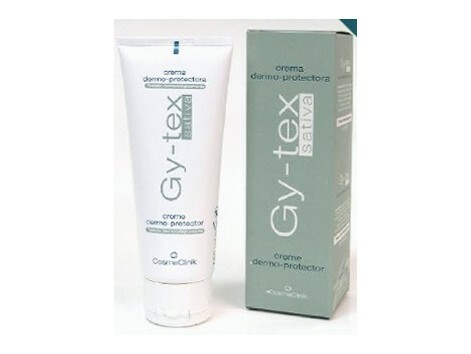 Gy-tex Cosmeclinik Sativa 100ml. Dermo-protective cream. Moisturizing. Epidermal cell repairs the damage. It contains no perfume. Repair cellular damage. High tolerance formula. Dermatologically tested PRESENTATION: 100 ml tube. INDICATIONS: Especially suitable for skin care in the areas: head, neck, thorax and abdomen which are subjected to aggressive treatments. PROPERTIES: Emulsion made with Opuntia ficus indica, the active ingredient capable of improving the defense mechanisms of skin damaged by external aggressions, favoring altered tissue repair. In turn Vitamin E, Aloe gel extract Avena, exerting a moisturizing, soothing and decongestant ideal for sensitive skin. DIRECTIONS FOR USE: Apply 2 or 3 times a day. Then exert a gentle massage to facilitate absorption. Note: Radiotherapy treatment for users, not to apply the product at least two hours before the meeting. If in doubt consult a specialist. ACTIVE PRINCIPLES: Opuntia ficus indica: New active ingredient that works by increasing the rate of HSP synthesis, known as stress proteins, responsible for repairing cell damage caused by exposure to aggressive treatments. Aloe vera gel: Hydrating properties, soothing and refreshing, providing quick relief to the congested skins. GINKGO BILOBA: Their effectiveness is mainly due to their content of flavonoids, a major effort to provide anti ¬ free radicals and decreasing the permeability of the capillaries. Therefore its use is recommended especially for fragile and sensitive skins. AVENA SATIVA: emollient, soothing and decongestant. Alpha Bisabolol: important anti-inflammatory action, antiphlogistic and inhibitors of erythema. Shea butter: Care and softens the skin, helping to protect the surface of the skin irritations. Hyaluronate sodium brings hydration, softness and elasticity to the skin. Excipient: Emulsion 0 / W light of rapid absorption. Has a high skin and is formulated without traditional emulsifiers, lecithin being replaced by those of plant origin. It contains no perfume. No parabens.